Any one of these easy decor ideas will add the perfect finishing touch to your traditional Thanksgiving table. “Easy” is the key word… we’re all far too busy in the days leading up to the Thanksgiving feast to weave our own raffia cornucopia! But just the right handmade detail can create the perfect mood for the day. Here are some easy ways to impress without stress! 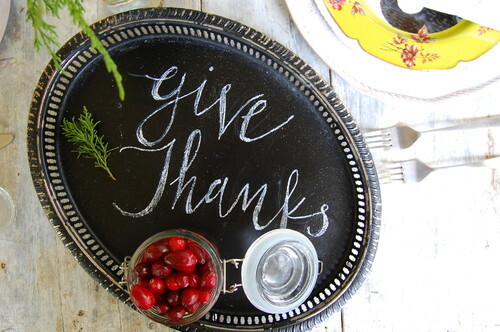 An old thrift store platter becomes a charming chalkboard for your personal Thanksgiving message. Just cover a metal tray or platter with chalkboard spray paint… but don’t serve food directly on the tray! There is something about handwritten decor that is just so special for a holiday gathering. It is personal and welcoming with a heart-warming nostalgia that takes us back to simpler times. These humble brown paper and string handwritten tags created by Becky at the ThisIsHappiness blog are terrific examples. 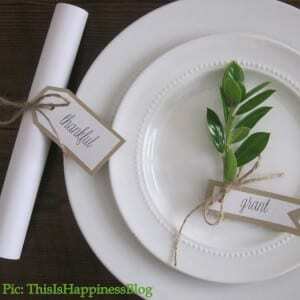 Used to tie napkins and tied to a sprig of leaves as a place card, the tags would be quick to make and you could put different words of gratitude on each napkin holder. Everyone will feel the harvest happiness when they see these pumpkin and squash vases. Squashes come in so many colors you can take your pick for a lively ‘traditional with a twist” display on your Thanksgiving table. 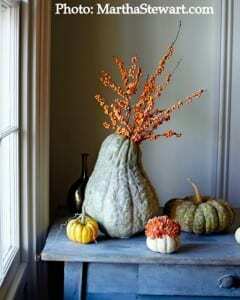 Choose a hefty squash like a Hubbard to hold large stems or mini pumpkins for small posies. To hold the flowers and some water, just carve out enough space in the squash to nestle a glass jar — or a votive holder for tiny squash. You might need to trim the bottom of the squash to make it stand upright. If so, rest the cut surface on a tray or runner so the juices don’t stain your table! Martha Stewart gives more how-to-make-it instructions if you need them – she created this lovely display. 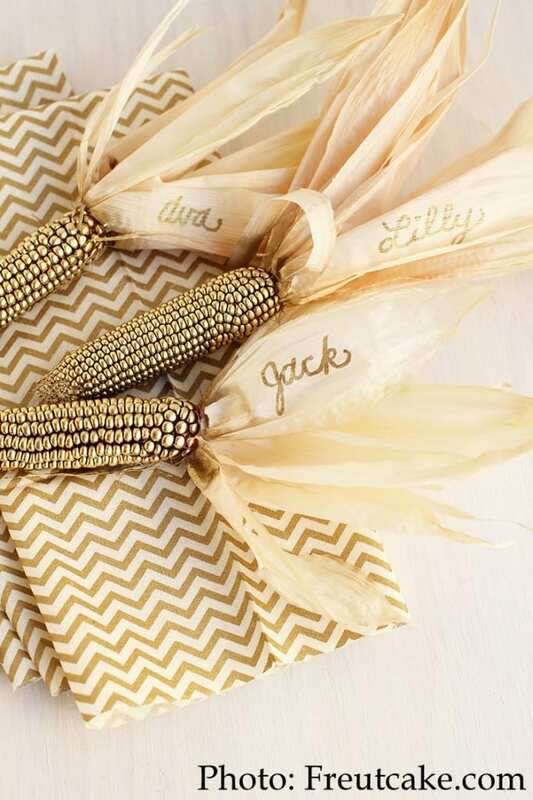 For a more glamorous look, gold-sprayed dried miniature Indian corn cobs make dazzling place cards, with each name written in gold pen on the husk. The easy DIY project is sure to be a talking point at your Thanksgiving table. The design is a perfect match for an opulent Rococo or Louis XIV style room, and it would also fit nicely with Hollywood Regency style. If you make this cookie turkey as a centerpiece it is sure to charm everyone, although all bets are off as to whether anyone will want to dismantle it to eat all the cookies after dinner! The cookie turkey should be simple enough to make just by copying the picture although you’ll need a steady hand to do the decorative glazing. No cocktails till you’ve finished! If you’ve run out of time to do even the easy ideas above, you can never go wrong with a lovely basket filled with harvest foliage, fruits and vegetables. (This one is arranged by Yvonne on her Stone Gable blog.) 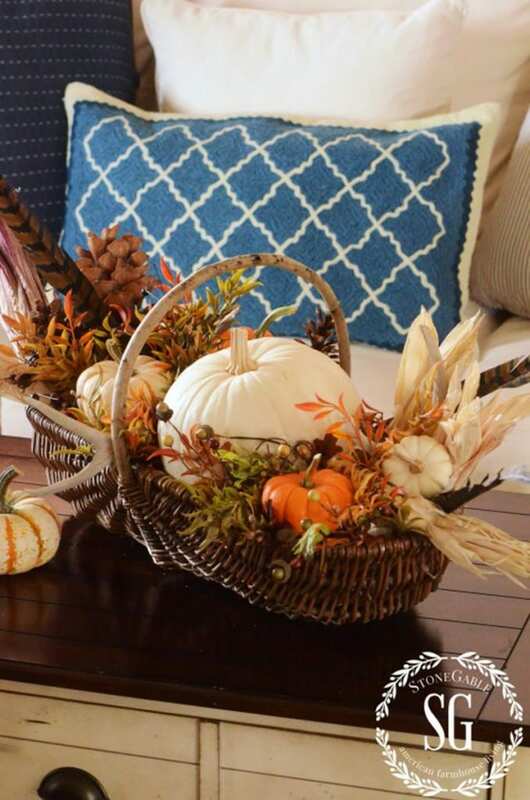 The basket captures the spirit of the season and it looks wonderful on all traditional Thanksgiving tables. It’s the perfect match for your antique French Country furniture or for Tuscan or Farmhouse style decor. 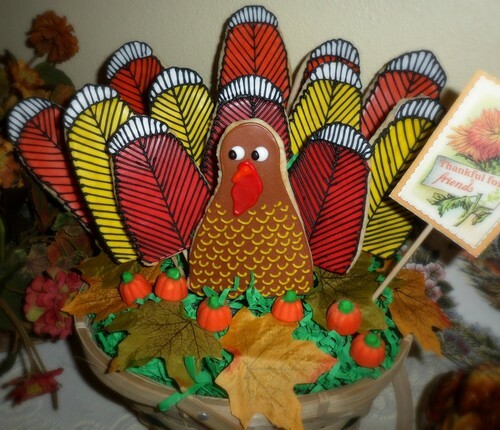 Happy Thanksgiving, however you decorate your table! This entry was posted in Entertaining, Holiday Fun and tagged autumn, creative home decorating, cut flowers, DIY, holiday decor, holiday decorating, holiday table, interior decor, table setting, Thanksgiving, Thanksgiving table, traditional home on November 14, 2015 by admin.